River Park Hotel & Suites is located in the city of Miami, which is a crossroads, a magnet for northerners seeking the sun and southerners seeking the sunnier side of life. Sometimes the mix is magic; sometimes it's oil and water. Despite the risk, travelers still visit from far-flung points for the sheer experience of it --the color, the excitement and the opulence of the first world buoyed by the tropical ambience of the third, Although visitors will find the standard white sand and blue surf, it’s the unique neighborhoods and communities in the Magic City that leave you talking about your trip for years to come, then planning a return engagement just to experience it all again. 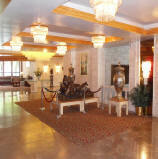 The River Park Hotel and Suites features an on-site restaurant, Mirado, that specializes in continental cuisine. There are also many other fine Miami area restaurants near this hotel. The 16-story River Park Hotel and Suites features 149 spacious rooms and suites. Each offers dial-up internet access(surcharge), coffee makers, video games (surcharge), and marble bathrooms equipped with Neutrogena toiletries. The River Park Hotel and Suites is located two blocks from the Flagler Shopping District, next to The Hyatt Regency and adjacent to The Miami Convention Center/ The James L. Knight Center. Walking distance from the restaurants and shops at Bayside Marketplace and the American Airlines Arena. 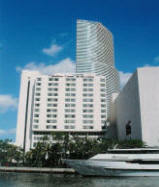 The hotel is also less than five minutes from the Port of Miami and the Business District of Brickell. The River Park Hotel and Suites is conveniently located next to the Miami downtown People Mover. Payment policy: Payment will be debited from your credit card 72 hours prior to check in. Cancellation policy: All confirmed reservations must be cancel within 72 hours prior to the day of arrival. Otherwise a late cancellation fee will apply. Late cancelations fee is first night accomodation+ 13% room tax. River Park Hotel and Suites is located two blocks from the Flagler Shopping District, adjacent to The Miami Convention Center and the James L. Knight Center, and two miles from the restaurants and shops at Bayside Marketplace and the American Airlines Arena. The hotel is also less than two miles from the Port of Miami. Guests of The River Park are just a short drive from Miami’s nightclubs, boutiques, cafés, and beautiful South Beach (seven miles).